TRIPOLI, Libya The Libyan government said Saturday that its forces had detained one of the key members of Muammar Qaddafi's inner circle, but a recording purported to be the slain leader's former spokesman denied the claim in an online posting and said he's not even in the country. The dueling reports, neither of which could be independently verified, came on the anniversary of the capture and killing of Qaddafi as a brutal civil war came to an end. The confusion reflected the turmoil that has persisted over the past year, leaving the oil-rich North African nation deeply divided. The anniversary of Qaddafi's death comes as a battle over Bani Walid underscores the challenges facing the country, which is awash with weapons and militias that remain largely out of control of the weak central government. Moussa Ibrahim was said to have been captured while trying to flee the city, a claim he vehemently denied in the recording. Bani Walid, some 140 kilometers (90 miles) southeast of Tripoli, was the last major city in Libya to fall to the uprising, thanks in part to its protected location in a valley near the mountains. Over the past year, it has seen periodic violence and emerged as the most significant town in Libya still resisting the country's new authorities since Qaddafi was slain near his hometown of Sirte last year. "We've lost too many people in Bani Walid and we are still losing them so I don't think it's time for a celebration," said Abdessalem Mahfoud, a local neighborhood council member in Tripoli. The turmoil in Libya, which overthrew Qaddafi last year with the help of NATO airstrikes, has become a campaign issue in the U.S. presidential race after an attack on the U.S. consulate in the eastern city of Benghazi killed Ambassador Chris Stevens and three other Americans. For many who fought against Qaddafi, the new Libya cannot be born until the last vestiges of the old regime, fugitives like Ibrahim and towns like Bani Walid, have been routed. "I don't think things are really moving in the right direction until we finish with Bani Walid because it is stopping us from making a new Libya," said Abdel-Basit al-Mzirig, a former deputy justice minister and now on Libya's human rights council. The urbane, English-speaking Ibrahim became the face of the regime in its final months and was the most well-known former regime figure to remain unaccounted for after Qaddafi's son and heir-apparent Seif al-Islam was taken late last year. 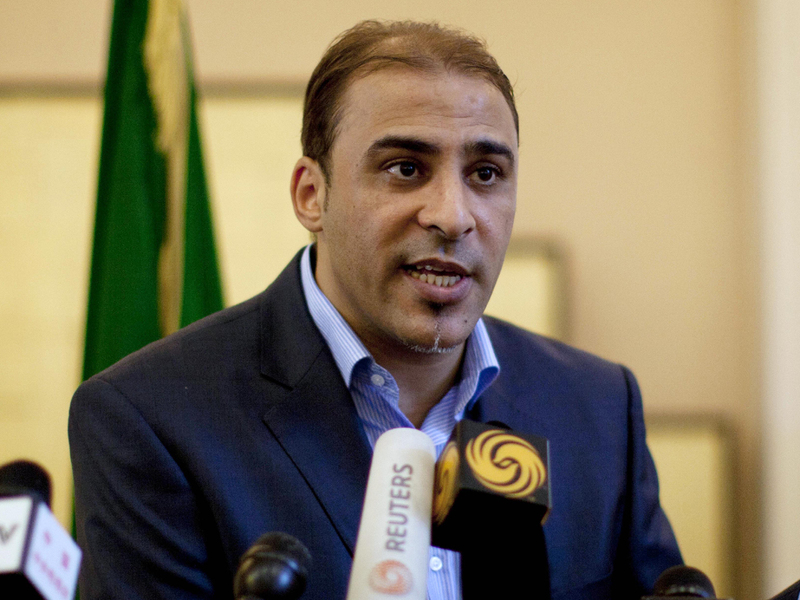 The regime's former intelligence chief Abdullah al-Senoussi was later detained in Mauritania and extradited to Libya. The seven-minute recording, which was posted on Ibrahim's Facebook page, rejected the reports that he had been captured, as well as rumors about the detention of Qaddafi's son Khamis, who was reportedly killed last year. Libyans have failed to overcome deep enmities between those who fought to overthrow Qaddafi and former loyalists of the late leader, whose eccentric and brutal rule focused on pitting tribes against one another. In the year since Qaddafi's death, conflicts have broken out around the country, and despite the unprecedented election of a 200-person national assembly, the central government is weak and power remains with the armed groups that sprung up with the rebellion. These groups, especially the armed militias, have often pursued their own agendas, some dating back to longstanding feuds inside a country Qaddafi controlled unchecked for more than four decades. After Qaddafi was killed, the former rebels negotiated a takeover of the Bani Walid and then looted it, prompting the angry citizens to form their own militia and throw out their new rulers in January. The tensions boiled over when one of the rebels celebrated for being among those who captured Qaddafi, Omran Shaaban, was captured and allegedly tortured by the Bani Walid militia. "We are protecting Libya because there are pro-Qaddafi people in Bani Walid. There are many wanted people there  they are devils," said Omar Saleh, a militiamen with the Libyan Shield manning the Umm Rashrash checkpoint 60 kilometers (40 miles) from Bani Walid. "We haven't started to bombard them yet  we could if we wanted  but we are afraid of hitting civilians." He said the shooting was coming from all sides. He claimed the city only had 150 to 160 pro-Qaddafi people, but that was hotly disputed by the militiamen who said there was a list of 400 wanted figures from the old regime and hundreds more gunmen. The UN representative to Libya Tarek Mitri called for a mediated settlement, urging all involved to abide by "international humanitarian principles" and avoid targeting civilian areas. According to hospital official in Misrata who spoke on the condition of anonymity because he was not authorized to speak to the media, said 14 Libya Shield fighters were killed in Saturday's fighting and 120 wounded.